The MaxxAir fan is great, but it can’t do its job if the rest of the van is sealed up. It needs a flow of air in/out of the vehicle. 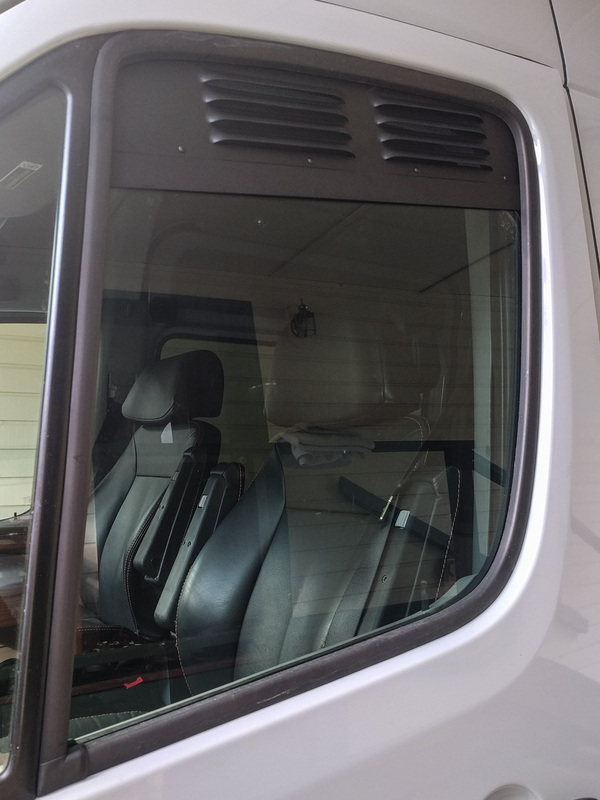 We’ve thought about replacing the window behind the driver with an aftermarket vented one, or making another hole in the floor or step area to act as a vent. Before we did that though, we wanted to try these slide-in metal vents from EuroCampers. They fit in the driver’s and co-driver’s windows and are held in place when you roll the window glass up. First impressions are that they are functional but not the type of quality you might expect for the cost. The vents are cut from sheet aluminum (at least, a non-ferrous metal), with a formed lower edge and riveted inner piece to accommodate the window glass. The top edge is folded over to hold the mesh bug screen in place behind the louvers. An extra piece of metal has been added to hold the back edge of the mesh at the point where the folded piece was cut off. The curved corners of the vents (top left and right) are not radiused. Instead, it looks like they were cut out with shears using several straight snips to approximate a curve. There are rough spots and a couple of sharp corners. The added piece of metal along the top of the vent is punched in place. We don’t know how long it will stay there. These vents are obviously hand-made, and not necessarily in a good way! You install the vent by lowering the window, pushing the back corner of the vent into the gap in the window seal, then pushing the front corner up to the top of the window opening. When you raise the window again, it slides the whole vent up to the top of the window opening and holds it in place. The window glass slots in to the formed edge at the bottom of the vent. 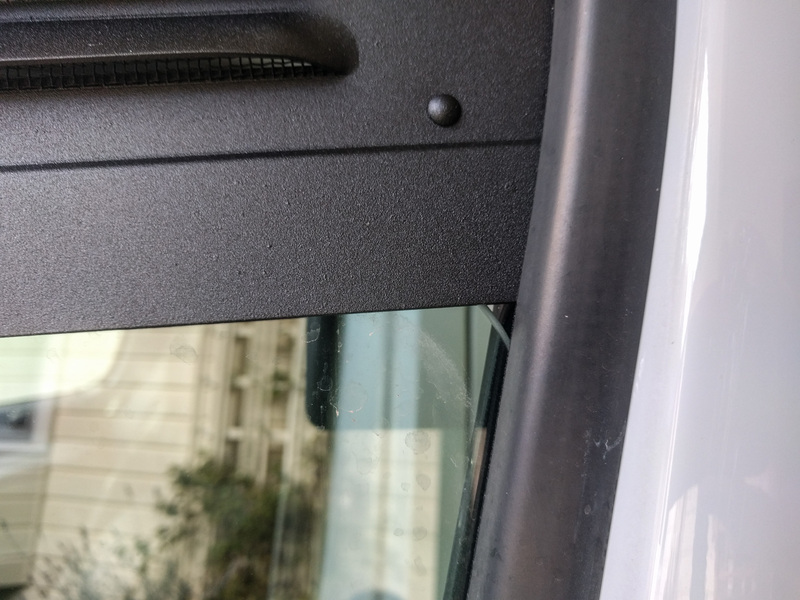 On our 2015 van, there’s a little gap at the rear edge of the window, where the glass curves down lower than the vent metal. The rear corner of the glass is curved in a way that leaves a gap at the back top corner. The vent works fine still, but it’s this kind of attention to detail that’s missing. 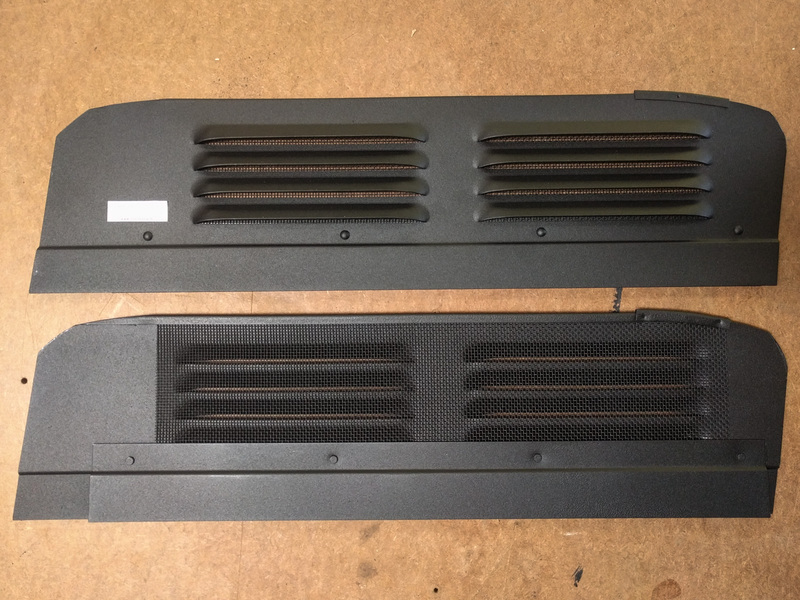 Interestingly, despite the EuroCampers site saying that the vents are for 2007+ vans, the package says 2006-2013. Europe got the NCV3 vans one year earlier than the USA, so that is why it starts in 2006. Mercedes did a minor body refresh in 2014. We wonder whether part of that was different cab door window glass? You can buy this product from the EuroCampers site if you’re in the USA. If you’re in Europe, it’s sold by Reimo. EuroCampers’ mark-up is probably fair, considering they have to import, stock, and re-ship the vents. The window vents are sold by Reimo in Europe. The window vents on their own don’t move air through the van. You could potentially bolt a computer fan on to them to help with this, but we think they are best as an addition to a roof vent fan like the MaxxAir that we added. We will probably need to make a bag to hold these things when we’re not using them. They rattle around annoyingly. They are not super-high quality. They are suitable for their job, and they are probably secure enough, but they have more rough edges (literally!) than we’d expect for the price. If you have access to sheet aluminum and a louver press, you could knock a pair of these vents out in an afternoon with at least the same level of quality as the store-bought version. 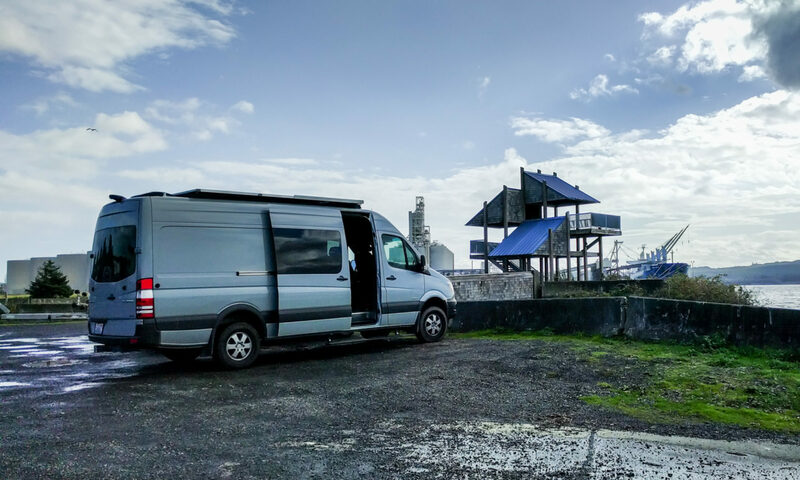 The thing is, louver presses are relatively rare and we have plenty of other DIY projects to do on the van. Overall, the EuroCampers/Reimo vents meet our needs and are more convenient than the other options we considered. We wouldn’t unequivocally recommend them though because the build quality doesn’t match the price. We have used these vents, for 18 months. The rough edges are an issue in the fact that they have to slide along the window rubber threshold. We try to pay close attention when we place them. So far so good. They do make a difference on moving air. But finding a place for them in the van now that’s another challenge, where they don’t rattle. Pat, I’m thinking of making a bag for them just to stop the rattling. I’m also wondering about filing down the sharp edges. My guess is that new window rubber would cost more than the vents did and I really don’t want to have to think about replacing it just because the vents sliced through it. Seems like you could make these yourself out of sheet ABS and do a better (or at least as capable) job… Maybe I’ll try that once I get everything else done – could be a good winter project. Yeah, after seeing them in real life, I realized that I could probably have used some of the ABS I have lying around to make the same thing. It would involve making a form to press the hot ABS sheet over to create the louvers, unless you just decided to make holes in the plastic instead. I doubt much rain would get in under most circumstances. One could make them. But it is a matter of priorities. In our case we’ve had to redo so much that a builder did that it never was even mentioned. & we store them under the mattress, no bag. But I did put a swatch of Duct tape & label L & R, I was vetoed P & S! I bought these as well and also was not impressed with the quality and the fit for the cost. However after a little bit of cutting, grinding and painting and you can round off the sharp edges and get them to fit better. This also helps with getting that exposed little lower corner section covered. I used industrial the hoop “soft” side of 2″ wide black velcro and lined the inside part where the window inserts. This helps protect the window and tint on the inside. I think we’re going to grind the corners down too. Didn’t realize that might close up the hole in the lower corner – good to know! I have some felt that I might glue into the slot where the window glass fits. Those things are straight booty. Get them far away from your van ASAP because they are bringing down the value. Get some T-vent windows and use those as a fender for your bike. Seeing those in your windows hurt my eyes. Yeah, but they work and they aren’t $600 + installation hassle. Trade-offs. It’s all trade-offs. have you considered using the factory heat/air intake vent and fan? i wonder how hard it would be to turn on the blower without the ignition, particularly since i have a sunroof rather than a rooftop power vent. Milt, my guess is that unless you boosted your starter battery you wouldn’t have much time running the blower, even if you could turn it on without the ignition. I’m also not sure what volume of air the system could move. It would definitely help but would probably be inefficient. I do know that another Sprinter forum member made his own version of the window insert with some high efficiency computer fans attached to it. That gave him good airflow with relatively low power draw. Of course, it still means putting something in the window space rather than having the convenience of the factory vent system, but it’s less likely to leave you stranded if you run it from your house battery.